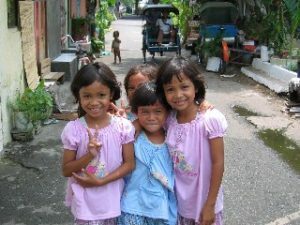 December 5th, Pontianak, Indonesia – While most people here are good natured there are some who are just trying to take advantage of you; and even when they are not, the difficulties of communicating can lead to situations where it feels as if you are being taken advantage of. In Semarang the taxis have meters and are supposed to use them; so when the cab driver said minimum 10,000 I ignored him and resigned myself to pay whatever showed on the meter rounded to the nearest 1,000 which came to 8,000. He was clearly unhappy and kept screaming minimum 10,000, so as I have been taught I ignored him and started to walk away. At this point he did the unexpected and returned the 8,000, got into his car and drove off. Had this been it then it would just go down as another awkward travel moment but the next night we were looking to take a taxi again and there he was. We were in another person’s cab when he recognized us and prevented us from shutting the door; I was a bit worried at first but since we were surrounded by his fellow drivers and not one came to help him (they didn’t come to help us either; but the tie goes to the foreigner) I assumed I was in the right. The cab we were in wanted to drive away (he could use the fare) and was about to when the antagonist took the key out of the ignition. The only thing left for us to do was get out of the car and walk away; so we did. We got into another cab a little bit up the road and he drove us to our hotel; he didn’t ask for a minimum at all. Whether he was trying to milk wealthy tourists for cash or a minimum was really appropriate I’ll never know, but the problems that plagued the start of our next adventure were solely due to communication issues. We arrived in Ketapang with little information; no map, no guides, just an address for the Ganung Palung park office and an address for a hotel. It took a while to arrange transport from the airport as taxis are non-existent; so we chartered a vehicle to take us to the office where we would try to arrange a trip into the park. Though initially the driver did not recognize the street name, after some consultation with other people at the airport, he received directions to the office. These directions were little help; he had to get out and ask three more times before finally finding the street. Then, despite clear numbering on many houses, he had to ask a few more times to find the address. Once at the office I had no idea what to expect; last report was the park was closed to visitors and a fax I had sent to office resulted in no response. We sat down with the employee who apparently had the best grasp of English and we started talking arrangements. This park has been the site of a research center associated with Harvard University for orangutan study; and it was my hope to visit the research center where it was supposed to be relatively easy to see the creatures. As it turns out, tourists are no longer being taken to the research station at Caban Panti nor are researchers (the government is not issuing permits for researchers right now and the people in the office seemed hopeful but unsure when/whether they will again) but they are taking tourists into other parts of the park. It was not, however, until we were on our way that it was made clear we were not going to the research center. This was not the only issue left out of our initial discussion and the others would lead to some early difficulty, ill-will and almost stop the expedition before it started. This park consists of the most pristine primary forest we have ever walked through. As a result, the trail was a difficult steep, slippery up and down through dense, leech infested forest. At times the trails we were on were so overgrown or nonexistent that it was only with a machete that we could make it through; but before we could even start that trek we had to work through several problems. We had arranged for our guide to meet us at our hotel and it was implied that he would transport us to the trailhead where we would begin the long walk to camp. It turns out what they forgot to mention was that we had to arrange transport to the trailhead, and pay for it, ourselves. Our guide was unaware that this had not been mentioned to us at the office; and it began the first of what would be several cases where he had to bridge the gap between the information provided us and the complete story. After some discussion the guide and the man from the office took us on their motorcycles to the bus station where we hopped a bus to Sikudana and the trailhead. From where the bus dropped us off we had to hire ojecks (public transport where you ride as a passenger on someone’s motorcycle) to take us the last few kilometers to the village where the park entrance is located (in some villager’s house who happens to have some extra bedrooms for overnight guests) It was here that we picked up our porters and started our trek, albeit a couple of hours later than initially hoped, or at least that is what I thought would happen. It took our guide a while to organize the porter, and when it looked like there would be only one we had a problem. At the office I was told we had to hire porters from the local village, I said we were willing to carry our own packs but was told that the porters are mandatory. That was fine with us, it meant we could take our entire packs and not worry about carrying the load through the forest; but when we got there and there was only one porter but two of us, well you can see the dilemma. Additionally, while the park office had charged us 50,000 a day for the porters they were now asking for 60,000; we had a receipt from the office and our guide acted as intermediary trying to bridge the difference. Eventually we had packed all we needed into one bag and left the other bag in the village and thought we were ready to go; but it turns out one porter is just enough to carry the cooking material, tarps and food for the guide and porter. I had paid for his services to carry cooking equipment we didn’t really want to pay for in the first place and food for him for four days; this was not going to fly with me. After more deliberation between me and the guide and the guide and the porters we finally reached an agreement; and we got the second porter we had been led to believe would be there from the start. The next detail that was not mentioned to us at the park office was who was providing the food for the guide and the porters; it was expected that we would. Had this been told to us the day before it would not have been a problem; but now, already being annoyed, I was not in the mood to pay more money for their food. Eventually the rationalist in me won over and I decided not to jeopardize the expedition over $4 in food; we went to the poor excuse for a local store and bought rice, noodles and sardines (that is all these guys ever eat, breakfast, lunch and dinner). Now, finally ready to go 4 hours after our initial departure time, the guide suggests we spend the night in the village and start in the morning. There was no way I was paying for the guide and porters to spend a night in their own village eating the food I just bought them; we insisted that we start up the trail and they reluctantly agreed. 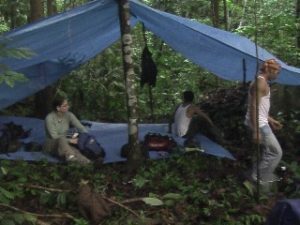 It was a couple hours in when I first learned that we were not going to Panti; instead of staying in rooms at a research station we would be staying on the ground at a station that was nothing more than some tree trunks set up for patrols to throw a tarp over. Of course we would not make it to that station tonight; because of the late start and the danger of trying this trail in the dark, we had to set up a makeshift camp still a few hours from the station. By day two much of the early frustration seemed to have dissipated (except maybe with the more vocal of the porters) and we got an early start towards the campsite. We were told the hike would take about four hours but it was hard going up a slippery trail and it felt like we must be pacing slowly. Walking in this jungle is like nothing else we have done; within a few minutes you are drenched in sweat from the humidity and that wetness does not dry until you are out. You spend so much time basically crawling up the mountain that your clothes, shoes and socks are covered in dirt. Since this will happen quickly everyday, there is no point in dirtying multiple sets of clothing so you put on the same wet, dirty clothes every morning; definitely the hardest part of the day. 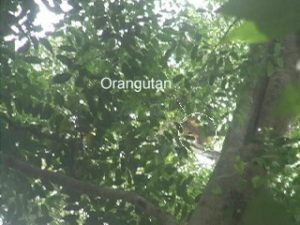 After about two and half hours, having seen fleeting glimpses of what may have been orangutans along with some tree and ground nests, we got our first (and only) good look at the animal we had come to see. It was a great sight that really picked up the mood (though the nature of video and photos up a 200 foot canopy means the visual record of the sighting is about as reliable as the standard Bigfoot film) and when we asked how much further it was, expecting an hour or more, the reply was just 20 minutes. The rest of the trip to the campsite was still difficult but much easier knowing that it was just a little further. The campsite had a few problems of its own; it was infested with bees, biting flies, mosquitoes and as I would learn the next morning fire ants. In fact we would receive several stings, bites and other malicious acts (but only one leech that we know of) here which made the time spent at the site uncomfortable. That meant we should spend as much time as we could hiking in the jungle; except the ‘trails’ were of the make it as you go variety and the vocal porter who was leading much of the way seemed to enjoy taking us on the most difficult routes he could find. The hiking was physically draining; I would have more video of the dense forest if I didn’t need both hands, both legs and any other instruments I could find to trek the steep hills. On day three it was more of the same hiking, and we were both sore and tired. The jungle was immense and beautiful; we were surrounded by wildlife as evidenced by the sounds from the gibbons marking territory in the morning to the orangutans, monkeys and birds calling all day and the orchestra of insects and birds throughout the night. But with all this, all we saw were some monkeys and a few glimpses of hornbills. Day four meant we had to hike out; the last bus back to Ketapang was at 2pm and since we assumed we would need at least five hours to get out (the time it took us over two days to get in) we wanted to get an early start. We did the same hike we had done on previous days towards where we first saw the orangutan and as we were crossing the stream we could hear the movement in the trees. A quick look up and we saw a troupe of agile gibbons swinging across the forest roof; it was just the start we needed to get us going. We made it to our original campsite about an hour faster than it had taken us two days earlier; and from there it was all downhill to the village. In the village we stopped by the porter’s house for some hot sweet drinks made from the sap of one of the trees and we met his family; it seemed that at this point there was no more of the ill-will that plagued the early days. Up until this point, a few hundred meters from the park office, we had avoided walking in rain; but just then the downpour started and we replaced the sticky wetness of the sweat with a refreshing wetness of the rain. We waited out the storm and hired ojecks back to catch the bus. Now that we are out I guess the open is question is was it worth the difficulties and the effort? I don’t think I need to do this rough a trek again anytime soon, but we both agree it was a fabulous experience that we are glad we had. For now though, our next few adventures will be of a less demanding nature, we hope. I am writing this in the capital of West Kalimantan, literally straddling the equator, expecting to take a bus tonight across the border into the Malaysian state of Sarawak where we will spend a few days resting up in the city of Kuching. We will take in some close by (and more accessible) jungle and beaches while we decide what our next Borneo adventure will be.